This Asus WL-330NUL Multi-Mode Pocket Router is cool and is a great addition to your traveling toolkit. For $34.55, it can serve a number of purposes and help you out in a pinch! First, if you need a USB Ethernet dongle for a Windows, Mac, or Linux laptop/ultrabook that does not have an Ethernet port, it can be used to become "wired". Since I already carry an Apple USB Ethernet dongle, this now replaces it in my travel bag. This tiny device (2.5" L x .75" W x .5" H) is well-made and the USB portion folds into the back for protection while not in use. The device needs power, which can be gotten from a USB port on a computer, from a wall socket via a 5 V, 1A power adapter, and even by plugging it in to a portable power bank! If you plug an Ethernet cable into the Asus WL-330NUL Multi-Mode Pocket Router and plug it into a power source, it acts as a wireless access point and you can simply pick the device's SSID and type in the provided password to connect with your computer or mobile device. If you plug the device into a computer's USB port and plug an Ethernet cable into the end, it can act as a wired network connector for your computer. If you use Windows, there is a utility included to configure the router. 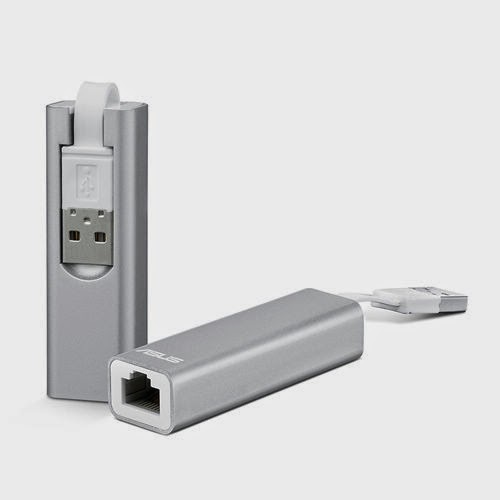 The Mac seamlessly allows the use of the Asus WL-330NUL Multi-Mode Pocket Router as an Ethernet dongle. To connect the Asus WL-330NUL Multi-Mode Pocket Router to an existing wireless network and use it as a wireless router, simply plug it into a power source or computer USB port and then use the utility app (Windows) or visit a special ASUS Web page, enter the admin password which is etched into the side of the Asus WL-330NUL Multi-Mode Pocket Router and enter the SSID and PW of the existing wireless network to connect the router to that wireless network (Mac, tablets, and smartphones). When using the utility or the special Asus Web page to configure the Asus WL-330NUL Multi-Mode Pocket Router, you can even set up an open or passworded guest network that others can access with their computers or mobile devices. The Asus WL-330NUL Multi-Mode Pocket Router works with Windows XP through Windows 8, Mac OS X 10.5-10.8, and Linux. It supports 802.11b/g/b networking protocols and 64/128-bit WEP, WPA TKIP/AES, WPA2 TKIP/AES encryptions. You can even assign the Asus WL-330NUL Multi-Mode Pocket Router a static IP address via the configuration utility or special Asus online config page if needed for security purposes. So, this router can be used for many purposes and has found a permanent place in my travel bag!